Is Facebook About To Kill Periscope & Meerkat! Facebook Mentions is the app that many people see on the App Store but very few people actually know what it does. It is the app for Facebook verified celebrities to manage their digital presence. 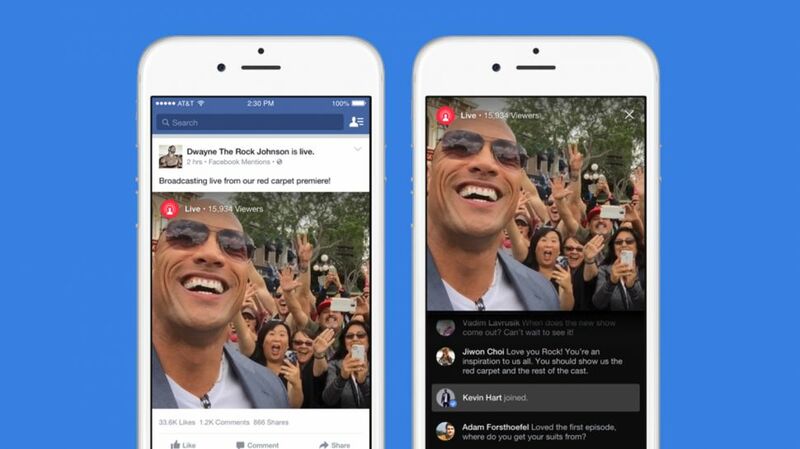 On August 5th Facebook announced a new feature coming to the Mentions app, Live Streaming. This feature allows certain users to stream video right to people’s timelines. That means you can watch celebrities and other people live from your favourite events. So far only celebrities have access, however, according to a recent post on Techcrunch the Mentions app will also be rolled out to all verified users giving them access to Facebook Live. This includes people such as musicians, actors, athletes, politicians, etc. Does this mean we can expect to see Facebook Live eventually rolled into Facebook proper? Maybe, it depends on the success and how the audience responds to the new feature. Facebook is known to test new features with small groups of users first before they roll them out globally, so could this be a test before unleashing the streaming functionality to everyone? Facebook Live has two major competitors that have already been around for a few months and have become the most popular apps when it comes to live streaming: Meerkat and Periscope. Both apps offer more features than you would find with Facebook Live but Facebook’s entry into the competition is new and with the massive following of public figures and celebrities on the platform it would be of no surprise if Facebook Live quickly leapfrogged its competitors! Meerkat is one of the most popular live streaming apps as it allows anyone to stream live video to their twitter followers. That is right, anyone can use it, you don’t have to be a celebrity. This is big for anyone who doesn’t have enough Facebook followers to be an influencer. Meerkat sends notification to your Twitter followers when you schedule a stream. When Twitter bought Periscope, Meerkat took a hit. It has snapped back though. Periscope is an app that Twitter bought and has the same purpose as Meerkat. Periscope wants to allow people to discover the world through other’s eyes. Periscope will be the biggest competition for Facebook Live, why? well first of all its backed by Twitter, Periscope is also compatible with both Android and iOS devices, all of the others only work on iOS devices. Seeing as how more and more users are using Android devices compatibility for those is necessary. Periscope have also recently announced they have hit 10 million users with 350,000 hours of video being streamed everyday! Will Facebook Live kill its competition? Facebook seems to love killing its competition but it hasn’t always been possible. Facebook Poke, designed to go head-to-head with SnapChat, failed. In order to take charge of the niche Facebook will need to start allowing anyone to stream and develop a version of the app that is compatible with Android. Facebook Live does offer one feature that none of the other service do. You can watch the recorded stream on a celebrity’s timeline after they have finished their stream. This allows people who were at work or otherwise occupied during the original streaming to still watch the most recent news. So far there is nothing to show that Facebook will get a leg up on the competition . Facebook Live is too focused to be able to move either off their standing for now. However with more people than ever before sharing, discovering, and engaging with video on Facebook it would be of no surprise if they win the video battle on all fronts. Do you think Facebook will kill Periscope & Meerkat with Facebook Live? Leave your comments below! I think Facebook will do well at trying to beat their competition however as more people are looking for smaller and new social networks to be active on I think they may stick to the likes of Periscope more. I don’t think it’s great if Facebook start doing too much, I myself hate how much time I spend on Facebook I have even started calling people on it rather than on my phone. I don’t think Facebook are going to overtake Periscope but I guess we will just have to wait and find out.